Rapper Chris Webby is back with the follow up to his 2013 mixtape, Homegrown. 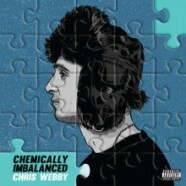 This time he’s set to release his debut studio record, Chemically Imbalanced via eOne. This time around Webby is bringing the heat. Webby is one of the most impressive up-and-comers in the game today and Chemically Imbalanced is proof straight up. This is one of the more diverse rap albums to drop this year, giving you songs you can dance to, smoke to, cruise to and more. Webby’s rhymes are impressive, mature and have substance- something a lot of rap music today has lost sight of. Not only that but the beats are intoxicating and addicting. Webby isn’t at it alone, though, he brings on some collaborators too. Dizzy Wright, Jarren Benton, Jon Connor and Talib Kweli are all featured on the album. Today’s big name rappers need to take a seat and learn from Chris Webby. Remember his name because he’s coming for the top spot and with Chemically Imbalanced he’s all-but guaranteed to become one of the biggest names in rap today.